Perly – Fashion Shopify Theme is no doubt a top-notch Shopify platform to embellish an eCommerce website that actually brings sales. Perly Shopify theme ensures best quality website design and rich functionality. To generate sales from your website, you have to provide your customers with a handy website. Perly – Fashion Shopify Theme is to make a breakthrough in this competitive world of eCommerce. However, Perly comes with 6+ Unique Home Version, 3 Header Variation and 3 Slider variations at a time. Multiple shop pages along with Blog sections are available in Perly theme. 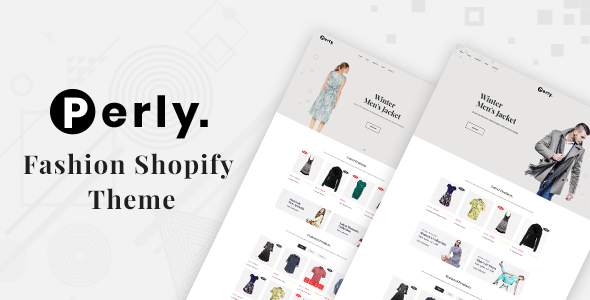 In this quick install Shopify theme we have inserted Shopify Builder, Theme Colors, Newsletter Popup, Ajax Popup Cart, Ajax Wishlist and Quick View options. Actually, your customer’s convenience is on top of our focus. They will surly enjoy the options like RTL Support, Multiple Currency, Feature Product, Full Width Product , Product review, Instafeed, Multiple Banner, Facebook comment, Product Video, Google Map and many more. We have tested this theme in multiple devices & browsers to ensure the best responsive layouts. On the other hand, we have tried to assist you with detailed Documentation, Google Analytics and even, we will be happy to support you in any of your further need. In the end, we guarantee you that installing this theme would be a wise decision indeed. You are welcome to check the demo and justify the quality before you actually purchase it.